Taylor 110 vs 210: Is there a Difference? 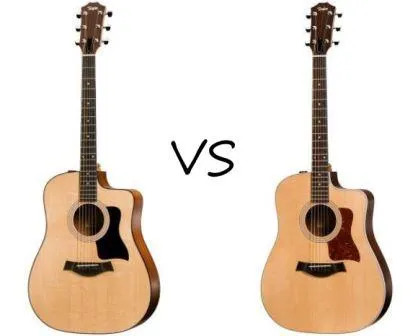 This review will compare the Taylor 110 vs 210 to see if there is a difference between the two. 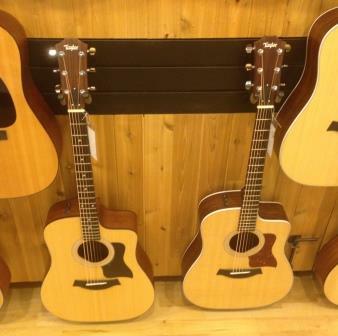 I am just back from my local music store where I had the chance to test the Taylor 210ce against the Taylor 110ce, to see if there was any noticeable difference and to see if that difference is worth the extra money that you pay for the 210ce. Absolutely, there is a noticeable difference in tone between the two. Playability-wise they are virtually identical but there is a clear difference in sound. Let’s get all of the differences out of the way first and then we’ll take a look at what actually makes the most significant difference. The following are different between the 210ce and the 110ce. The 210ce has layered Rosewood back and sides. The 110ce has layered Sapele back and sides. 1 through 4 are all cosmetic features so don’t come into the tone. Of course some people do put a lot of stock into how a guitar looks so this might come into the buying decision for some and not so much for others who don’t care as much about looks. The 5th point above has nothing really to do with the guitar so we’ll ignore that for now. The 6th point is the main one that I wanted to test out. I know that a guitar with solid rosewood back and sides sounds a lot different to a guitar with solid Sapele back and sides, all else being equal (i.e. same shape, same top, same bracing etc etc). But how much difference would the laminate back and sides make on an otherwise (in any way that would affect the tone of the guitar) identical guitar? I first had a jam around on the 210ce for about 5 minutes and then played the same material on the 110ce. Then I played for around 20 seconds on the 210ce and then 20 seconds on the 110ce. Then I had the guitar tech in store hold the 210ce and strum an E chord after which I strummed an E chord on the 110ce. We then switched and he strummed an E chord on the 110ce and I strummed one on the 210ce straight afterwards. As I mentioned above, there was a noticeable difference in the tone between the two guitars. When playing the guitars separately I could definitely notice there was a difference but I couldn’t really place it that well. But when I heard the two played one after the other, with the help of the salesman, it was clear what the difference was. It was exactly what I would expect the difference to be – only on a more subtle level than it would be with solid wood back and sides. The 210ce had a brighter sound that had wider tonal parameters. Said another way, you could really hear a crisper more pronounced low end and brighter more pronounced highs with less of a mid-range feel in there. It was a brighter tone and there were, subtly, more overtones. The 110ce, in comparison, sounded like you clipped the highs and lows form the sound of the 210ce and then boosting the mid-range. It was a slightly warmer tone and a more compact sound. In saying all of this, this was subtly so – compared with some other comparisons between tonewoods I’ve heard. But there is an easily audible difference. Laminate woods, at least where Taylors 100 and 200 series guitars are concerned, do make a noticeable difference to the tone of an instrument – where all else is equal. This difference would be, in my opinion, more subtle with laminate woods than it is with solid woods. Some might say yes but in my opinion, neither is better or worse. Some consider the Sitka Spruce/Rosewood combination to be the only tonewood combination worth having and that it’s the holy grail of tonewoods. Others prefer the warmer, more compact tones that come from having Mahogany or Sapele in the mix. Everyone’s experience of sound is different, which is why it can be hard to describe tone – when my interpretation of that tone might be different to yours. To some people what might sound bright and clear and nice to the ear might sound piercing and sharp to someone else’s ear and something that might sound warm and rich to one person’s ear, might sound dull and muddy to another’s. Personally, I really like the more subtle warmer tone that Mahogany or Sapele can bring to the table, whether as top woods or back and sides. And to be honest I also prefer different guitars for different styles of music. Sometimes Spruce/Rosewood or some other combination is more suited to the job. So if you’ve been weighing up between the 210ce and 110ce or any guitars from Taylor’s 100 to 200 series for that matter (I also tested the 214ce and 114ce in the same session), hopefully this post has helped you to learn the differences between the two. They both feel the same to play, so really the decision between the two is your tonal preferences. You do get a hard bag with the 210ce but you also pay more (and a lot of that extra cost is because rosewood is more sought after too, not just the hard bag and the gloss finish). It’s a little more for the 210ce but if that’s the sound you prefer then it’s worth the extra dollars – if you prefer the 110ce, then you’ll save yourself some money – which you could invest in a hard case for it. I hope this post has helped in your decision if you have being weighing up between the 210ce and 110ce or any other of the guitars from the 100 and 200 series. Check out my full reviews of the 110ce and 210ce at the links below.